"Mario Moreno" redirects here. For other people named Mario Moreno, see Mario Moreno (disambiguation). This article is about the actor. For the 2014 film, see Cantinflas (film). Mario Fortino Alfonso Moreno Reyes, known casually as Mario Moreno and professionally as Cantinflas (12 August 1911 – 20 April 1993), was a Mexican film actor, producer, and screenwriter. He is considered to have been the most accomplished Mexican comedian and is celebrated throughout Latin America and in Spain. His humor, loaded with Mexican linguistic features of intonation, vocabulary, and syntax, is beloved in all the Spanish-speaking countries of Latin America and in Spain and has given rise to a range of expressions including cantinflear, cantinflada, cantinflesco, and cantinflero. Though some of his films were translated into English and French, the word games so particular in Mexican Spanish were difficult to translate. He often portrayed impoverished farmers or a peasant of pelado origin. The character allowed Cantinflas to establish a long, successful film career that included a foray into Hollywood. Charlie Chaplin once commented that he was the best comedian alive, and Moreno has been referred to as the "Charlie Chaplin of Mexico". To audiences in the United States, he is best remembered as co-starring with David Niven in the Academy Award winner for Best Picture film Around the World in 80 Days, for which Moreno won a Golden Globe Award for Best Actor – Motion Picture Musical or Comedy. As a pioneer of the cinema of Mexico, Moreno helped usher in its golden era. In addition to being a business leader, he also became involved in Mexico's tangled and often dangerous labor politics. His reputation as a spokesperson for the downtrodden gave his actions authenticity and became important in the early struggle against charrismo, the one-party government's practice of co-opting and controlling unions. Moreover, his character Cantinflas, whose identity became enmeshed with his own, was examined by media critics, philosophers, and linguists, who saw him variously as a danger to Mexican society, a bourgeois puppet, a verbal innovator, and a picaresque underdog. 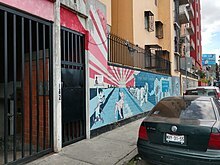 Apartment building that occupies the premises of the "vecindad" where Mario Moreno "Cantinflas" was born, former Sexta Calle de Santa María la Redonda (Sixth Street of Santa María la Redonda), today Eje Central Lázaro Cardenas 182. Mario Fortino Alfonso Moreno Reyes was born in the Santa María la Redonda neighbourhood of Mexico City, and grew up in the tough neighbourhood of Tepito. He was one of eight children born to Pedro Moreno Esquivel, an impoverished mail carrier, and María de la Soledad Reyes Guízar (from Cotija, Michoacan). The others were Pedro, José ("Pepe"), Eduardo, Esperanza, Catalina, Enrique, and Roberto. He served as president of one of the Mexican actors' guilds known as Asociación Nacional de Actores (ANDA, "National Association of Actors") and as first secretary general of the independent filmworkers' union Sindicato de Trabajadores de la Producción Cinematográfica (STPC). Following his retirement, Moreno devoted his life to helping others through charity and humanitarian organizations, especially those dedicated to helping children. His contributions to the Roman Catholic Church and orphanages made him a folk hero in Mexico. In 1961, Cantinflas appeared with Vice President Lyndon B. Johnson at shopping centers and supermarkets in San Antonio, Texas, to support the successful Democratic nominee to the United States House of Representatives for Texas' 20th congressional district, Henry B. Gonzalez, who defeated his Republican challenger, John W. Goode. Gonzalez was the first Hispanic elected to the Texas State Senate and as a U.S. congressman from Texas. A lifelong smoker, Cantinflas died of lung cancer on 20 April 1993 in Mexico City. Thousands appeared on a rainy day for his funeral. The ceremony was a national event, lasting three days. His body lay in state in the Rotonda de Las Personas Ilustres (The Rotunda of Illustrious Persons, formerly known as Rotunda of Illustrious Men) and he was honored by many heads of state and the United States Senate, which held a moment of silence for him. A 20-year legal battle followed between Mario Moreno Ivanova, Cantinflas' son and heir to his estate, and the actor's blood nephew Eduardo Moreno Laparade over the control of 34 films made by Cantinflas. The nephew claimed his uncle gave him a written notice[clarification needed] to the rights for movies on his deathbed. Moreno Ivanova argued that he was the direct heir of Cantinflas and that the rights belonged to him. Moreno Laparade won the lawsuit twice, but Moreno Ivanova eventually triumphed after two appeals. In 2005, Mario Moreno Ivanova, Jr. won the rights to 39 films and the name. At the same time, there was another legal battle between Columbia Pictures and Moreno Ivanova over control of these films. Columbia claimed that it had bought the rights to the 34 films four decades earlier, although the court noted several discrepancies in the papers. Moreno Ivanova wanted the rights to the films to remain his, and more generally Mexico's, as a national treasure. On 2 June 2001 the eight-year battle was resolved with Columbia retaining ownership over the 34 disputed films. The 1940s and 1950s were Cantinflas' heyday. In 1941, Reachi, the Producer rejected Mexican Studios companies and instead paid Columbia Pictures to produce the films in its Studios in Hollywood. By this time, Cantinflas' popularity was such that he was able to lend his prestige to the cause of Mexican labor, representing the National Association of Actors in talks with President Manuel Ávila Camacho. The talks did not go well, however, and, in the resulting scandal, Moreno took his act back to the theatre. On 30 August 1953, Cantinflas began performing his theatrical work Yo Colón ("I, Columbus") in the Teatro de los Insurgentes, the same theatre that had earlier been embroiled in a controversy over a Diego Rivera mural incorporating Cantinflas and the Virgin of Guadalupe. Critics, including the PAN and archbishop Luis María Martínez, called the mural blasphemous, and it was eventually painted without the image of the Virgin. Yo Colón placed Cantinflas in the character of Christopher Columbus, who, while continually "discovering America", made comedic historical and contemporary observations from fresh perspectives. For the first few months, he persuaded the King and Queen of Spain to fund his voyage so that he could let his wife "drive" so she could make a wrong turn and discover Mexico instead, allowing him to also discover Jorge Negrete so that the Queen – an ardent fan – could meet him. When Negrete died just before Christmas of 1953, he changed it first to Pedro Infante until his death four years later, and then finally to Javier Solis until his death in 1966. In 1956, Around the World in 80 Days, Cantinflas' American debut, earned him a Golden Globe for Best Actor in a musical or comedy. Variety magazine said in 1956 that his Chaplinesque quality made a big contribution to the success of the film. The film ultimately made an unadjusted $42 million at the box office (over $678 million in 2018 dollars). While David Niven was billed as the lead in English-speaking nations, Cantinflas was billed as the lead elsewhere. As a result of the film, Cantinflas became the world's highest-paid actor. After returning to Mexico, Cantinflas starred in the comic drama El bolero de Raquel (1957), the first Cantinflas film to be distributed to the United States by Columbia Pictures. The film was followed by more Cantinflas-Reachi-Columbia productions: El analfabeto (1961), El padrecito (1963), and Su excelencia (1967). After Su excelencia, Cantinflas began to appear in a series of very low-budget comedies directed by Miguel M. Delgado, which were produced by his own company "Cantinflas Films". These films lasted until El Barrendero, in 1982. In the visual arts, Mexican artists such as Rufino Tamayo and Diego Rivera painted Cantinflas as a symbol of the Mexican everyman. A cartoon series, the Cantinflas Show, was made in 1972 starring an animated Cantinflas. The show was targeted for children and was intended to be educational. The first animated version animated by Santiago Moro and his brother Jose Luis Moro for Televisa in the early 1970s (Cantinflas Show) which educated children by meeting such notable people such as Chopin, Louis Pasteur, Albert Einstein and William Shakespeare's Romeo and Juliet as well learning how important water and oil is and educational parodies of some of his famous movies like Su Excelencia [La Carta with incidental music from Aaron Copland's El Salón México] In the second version his character was known as "Little Amigo" and concentrated on a wide range of subjects intended to educate children, from the origin of soccer to the reasons behind the International Date Line. The second animated series animated in 1979 and dubbed in English in 1982 was a joint venture between Televisa and Hanna-Barbera and Mario Moreno voiced "Little Amigo"/Cantinflas in the Spanish version and Don Messick voiced "Little Amigo" and John Stephenson as the narrator in the English version. Both The Cantinflas Show and Amigos and Friends aired in the mid 1990s on Univision and Televisa re aired The Cantinflas Show in the mid 1990s. Although Cantinflas never achieved the same success in the United States as in Mexico, he was honored with a motion pictures star on the Hollywood Walk of Fame at 6438 Hollywood Boulevard. He earned two Golden Globe nominations (winning one) for best actor and the Mexican Academy of Film Lifetime Achievement Award. His handprints have been imbedded onto the Paseo de las Luminarias for his work in motion pictures. On August 12, 2018, the Google Doodle paid homage to Cantinflas on his 107th birth anniversary. Moreno's life is the subject of the biographical film Cantinflas (2014, directed by Sebastian del Amo). It stars Óscar Jaenada, who portrays a young Mario Moreno attempting to gain respect and make a living as an actor, and award-winning actor Michael Imperioli as Mike Todd, an American film-producer struggling to film his masterpiece. The film is centered in Moreno's personal life, and in the development of Todd's Golden Globe Award-winning 1956 film Around the World in 80 Days. Cantinflas is sometimes seen as a Mexican Groucho Marx character, one who uses his skill with words to puncture the pretensions of the wealthy and powerful, the police and the government, with the difference that he strongly supported democracy. Historian and author of Cantinflas and the Chaos of Mexican Modernity, writes, "Cantinflas symbolized the underdog who triumphed through trickery over more powerful opponents" and presents Cantinflas as a self-image of a transitional Mexico. Gregorio Luke, executive director of the Museum of Latin American Art said, "To understand Cantinflas is to understand what happened in Mexico during the last century". ^ Candelaria, Cordelia; Arturo J. Aldama; Peter J. Garcia (2004). Encyclopedia of Latino Popular Culture: Volume I, A-L. Greenwood. p. 103. ISBN 0-313-33210-X. ^ "Cantinflas: 1911–1993: Actor, Comedian – Mexico's Answer To Charlie Chaplin". Jrank. Retrieved 18 October 2009. ^ Yahoo Cantinflas biography. Retrieved 9 February 2006. ^ Ilan Stavans. The riddle of Cantinflas: Essays on Hispanic popular culture, 1st ed. ISBN 0-8263-1860-6. Albuquerque, NM: University of New Mexico. 1998, p. 37. ^ Biography from Vanity Magazine Retrieved 29 January 2006. ^ Sughey Baños (15 May 2017). "Mario Moreno Ivanova dejó todo en orden: viuda" (in Spanish). Eluniversal.com.mx. Retrieved 17 August 2017. ^ Diario Masónico (12 August 2017). "Solicitud de ingreso en la masonerĂ­a de Mario Moreno "Cantinflas"". Diariomasonico.com. Retrieved 17 August 2017. ^ Gilbert Garcia, "Castro unlike O'Rourke has much to lose," San Antonio Express-News, 31 March 2017, p. A2. ^ "Moreno Laparade gana derechos sobre las 39 cintas de Cantinflas". La Jornada (in Spanish). 11 March 2005. Archived from the original on 12 March 2007. Retrieved 9 February 2006. ^ "Hijo de Cantinflas triunfa en la Corte". Univision (in Spanish). 12 August 2005. Archived from the original on 13 November 2005. Retrieved 9 February 2006. ^ "Columbia gains ownership of films" (PDF). Archived from the original (PDF) on 18 December 2008. Retrieved 28 January 2006. ^ "Mario Moreno "Cantinflas" (1992) Su Ultima Entrevista Por Television" (in Spanish). YouTube. Retrieved 14 February 2015. ^ "Las 100 mejores películas del cine mexicano". Somo magazine. Archived from the original on 8 February 2010. Retrieved 28 January 2006. ^ Film awards for Cantinflas Retrieved 29 January 2006. ^ Biederman, Christine (19 October 2000). "The Power and No Story". Dallas Observer. Archived from the original on 15 April 2006. Retrieved 27 January 2006. ^ D'Souza, Karen. Mercury News "Remembering Cantinflas"
^ "Hollywood Walk of Fame – Cantinflas". walkoffame.com. Hollywood Chamber of Commerce. Archived from the original on 1 September 2016. Retrieved 11 February 2018. ^ Biography from Barnes & Noble Retrieved 25 January 2006. ^ "Mario Moreno "Cantinflas" Award". ErnieG. Archived from the original on 23 February 2006. Retrieved 29 January 2006. ^ "Mario Moreno "Cantinflas'" 107th Birthday". Google. 12 August 2018. Retrieved 12 August 2018. ^ "Ariel – Ganadores y nominados – Mario Moreno". academiamexicanadecine.org.mx. Archived from the original on 24 October 2014. Retrieved 29 August 2013. ^ "Golden Globe Awards Official Website – Cantinflas". goldenglobes.org. Archived from the original on 17 October 2013. Retrieved 29 August 2013. Jorge Alberto Negrete Moreno was a Mexican singer and actor. Heads or Tails is a 1937 film of the cinema of Mexico. The Golden Age of Mexican cinema is a period in the history of the Cinema of Mexico between 1933 and 1964 when the Mexican film industry reached high levels of production, quality and economic success of its films, besides having gained recognition internationally. The Mexican film industry became the center of commercial films in Latin America. El ministro y yo is a 1975 Mexican film. Miguel Zacarías Nogaim was a Mexican film director, producer, and writer. Cantinflas Show is a Mexican animated television series produced by Televisa. The series was created by Mario Moreno 'Cantinflas' and animated by Spanish animator José Luis Moro, who animated the pilot episode in 1972. Carmelita González was a Mexican lead actress known for her film roles during the Golden Age of Mexican cinema. She appeared in nearly 100 Mexican films during her career, opposite such actors as Mario Moreno Cantinflas, Pedro Infante and Jorge Negrete. González began her career by earning $21 but went on to win an Ariel Award for Best Supporting Actress for her 1984 performance in Luis Mandoki's Motel. Comedy in the Golden Age of Mexican cinema is a Mexican film that was popular during "El Porfiriato" which represents the reign of Porfirio Díaz as dictator in Mexico. Cantinflas is a 2014 Mexican biographical comedy drama film directed by Sebastián del Amo. Based on the life of actor and comedian Cantinflas, the film stars Óscar Jaenada as the title character, Michael Imperioli, Ilse Salas, Bárbara Mori, Ana Layevska and Adal Ramones. It premiered on September 18, 2014 in Mexico. In the United States it was released on August 29, 2014. It was selected as the Mexican entry for the Best Foreign Language Film at the 87th Academy Awards, but was not nominated. Vidal Cantu is a Mexican film producer and entrepreneur based in Miami. He is the CEO and cofounder of Kenio Films a Production Company and Film distributor focused on inspirational content.